The December edition of the BeeLines newsletter is available online. It includes reports about the 2016 Beekeeper of the Year and the Fall KSBA meeting, the State Apiarist’s report, and the 2016 Hive Count and Honey Count reports. 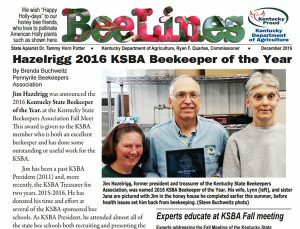 Past BeeLine newsletters can be downloaded from the Kentucky Department of Agriculture’s web-site or from the KSBA Educational Resources for Beekeepers webpage.